Where some see business others fear an ecological disaster. 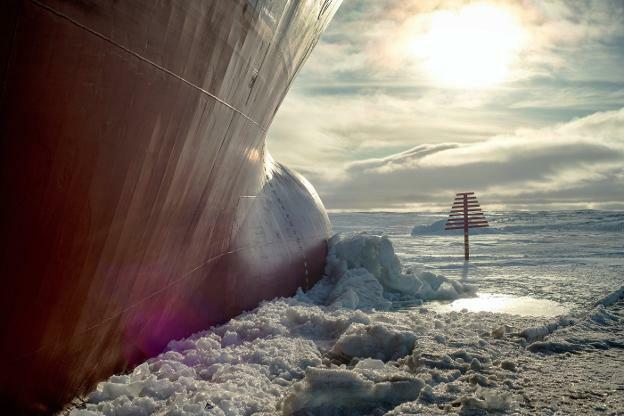 The Russian-flagged tanker ‘Christophe de Margerie’ became in August 2017 the first merchant to navigate the Arctic Ocean without the help of an icebreaker. It took 19 days to bring its natural gas load from Norway to South Korea, almost a week less than if it had done it through the Suez Canal, the usual route until then. That crossing opened a shortcut that is destined to become an authentic maritime highway. The main shipping companies of the world rub their hands thinking about the money they are going to save on fuel. For them, all that climate change and melting of the so much talked about may be an environmental disaster but, above all, it is a great opportunity to do business. Companies such as China’s Ocean Shipping Company or Japan’s MOL have already sailed successfully through the increasingly transient waters of the Arctic, which has lost three-quarters of its floating ice sheet in the past 30 years. Now she wants to try her luck, the Danish Maersk. This same month of September, one of its ships will transport a cargo of containers between the Russian towns of Vladivostok and St. Petersburg by the so-called North Sea route. Instead of crossing the Pacific, the Suez Canal, the Mediterranean and from there by the Atlantic heading towards its destination through the Baltic, the ship will only have to cross the Bering Strait and sail through the Arctic. If everything goes well you will have saved 7,000 kilometres and a good handful of money. The Northern Maritime Route has three navigation lanes. One is the Northwest Passage, which runs along the coasts of Alaska and Canada and reduces by a third the time of freighters sailing between Shanghai and New York through the Panama Canal. The Northeast Pass borders the Russian territory until reaching the Norwegian coasts. The third is the Transpolar Maritime Route, which transits international waters between these two steps but which, until now, can only make heavy icebreakers. The trip that the ‘Christophe de Margerie’ made in August of 2017 was emulated that same year by other 19 ships. And this is just the beginning. Russia, China, Canada, the United States and Iceland lead the group of nations that are preparing for greater shipping activity in the Arctic. For now, Russia is ahead. Vladimir Putin has recently stated that Moscow’s goal is to create a competitive and global transport route in the Arctic. According to Russian official forecasts, the commercial traffic of the route will be multiplied by ten by 2025. Behind it, China arrives. Experts estimate that between 5% and up to 15% of their trade flows (valued at approximately more than 500,000 million dollars) will move through the Arctic in 2020. In addition, Chinese analysts say that this route – which allows shortening around of 30% the duration of the trip between China and Europe – will also mean an important change in the industrial scenario of its coastal provinces and will offer, therefore, a great boost to its shipping industry. Commercial maritime transport plans to grow by 500% until 2025 on the Northern routes. It is a dream come true for many shipowners but a nightmare for the Arctic and its inhabitants. Although conditions have improved, navigating the waters of the Arctic continues to be dangerous due to low temperatures, poor visibility and the remoteness of any facility with a human presence. In addition, ships are at constant risk of encountering large masses of floating ice drift. A collision in such a hostile and remote environment would test the rescue teams, who would have many difficulties to approach the area of the accident. And if the accident causes a spill the consequences for the environment would be catastrophic. At the beginning of 2017, the Polar Code came into force, which establishes strict mandatory requirements to guarantee the safety of maritime transport in the polar regions and respect for the environment. The code strictly prohibits the discharge of hydrocarbons or oily mixtures into the sea, and all oil tankers must have a double hull and double bottom to prevent oil spills in the event of an accident. The rules also force the crew to store all the garbage that it generates in containers that must be grounded. That’s what the code says. That it is fulfilled or not in a place so safe from any view is something that remains between the crew and the inhabitants of the Arctic. The potential impacts of increasing maritime traffic on animals in the region have been studied by the University of Washington and the University of Alaska Fairbanks. According to their conclusions, 42% of aquatic mammals are exposed to the passage of boats. The most vulnerable are the narwhals (known as the unicorns of the seas) that are concentrated right in the middle of the navigation routes and are extremely sensitive to the disturbances of the ships. Neither do Beluga whales, Greenland whales and walruses, which have gone from the silence of the ice to the rumble of the propellers.